In class at Master Gohring’s Tai Chi & Kung Fu, we have resumed learning the Chen double saber routine. 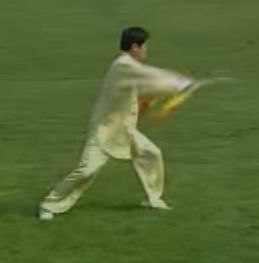 Below, the routine is performed by Chen Zhenglei. Earlier this year, we had reached the two jumps that we call monkey hops, which occur at about :30-:35 in the video. The name for these hops is actually Arrange Flowers (left and right). The next move is a combination of three-cutting, a turn, and what we call cleaning the blade. This move occurs repeatedly as a sort of punctuation between sections of the sequence. We do a lot more blade-cleaning than I see Chen Zhenglei doing–it is an optional flourish, as far as I can tell. In any case, the move finishes in the position shown above. Next we do a three cut on the left and stand on one leg with both knives overhead, as shown above. Afterwards, turn back to the right, leading with a right chop and turn around. Then we do another set of monkey hops/arrange flowers, followed by 3-cut turnaround and clean. Then we do a turn that finishes with blades crossed and extended as pictured above–sort of. It’s hard to catch an image of this. He stomps down with the right foot, steps forward on the left, and extends the crossed blades. 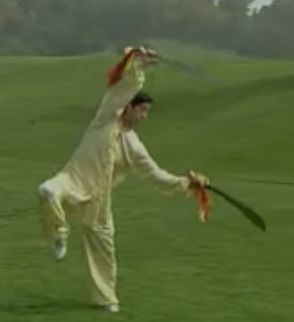 And Master Chen snaps the blades, thrusting forward. Three-cut, turnaround and clean. Again, the wash is optional. With or without, we finish each new move in the Chau Yang (Sun Facing) position. From here, jump around from the position shown at the top of this post to the position shown above, snapping the right saber. We are doing a vertical snap. 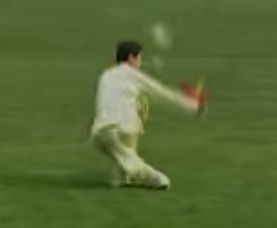 Chen Zhenglei does a horizontal snap. 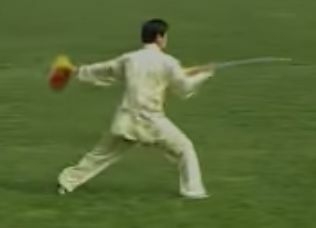 Turn to the left, slashing with the right saber, swing both sabers in a big clockwise circle and chop down in a cross stance (cha bu) as shown above. Unwind, jump around, and chop down with both sabers. 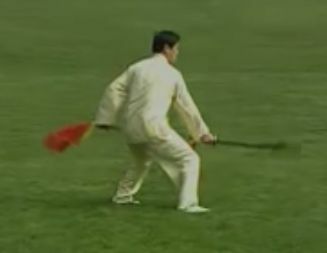 This movement looks just like Fan Hua Wu Xiou (Pao Chui). Three-cut, turnaround and clean. Then turn back to the left and perform the same move as above but facing in the opposite direction. That’s cut right, circle sabers and chop in cha bu, then unwind and chop with both sabers, fan hua wu xiou. 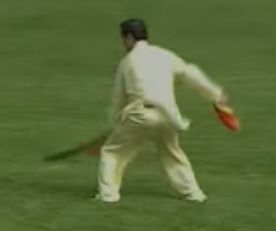 Then turn to the right, slashing with the left, in the mirror image of the same move–cha bu with right foot behind, unwind and fan hua wu xiou to chop with both sabers, left foot in front as shown above. From here, return to sun-facing broadsword position at the top of the page. This is a lot of moves at once, some of them quite difficult. We are three quarters of the way through the form, at about 1:30 of 2:00. This entry was posted in Moving Forms and tagged Double Saber by elizabethbuhmann. Bookmark the permalink.